Since my last update, I’ve moved forward a couple of seasons. As I begin to shape the club, my focus on transfers, youth policy and style all change. In this post I aim to look at what we’ve achieved in the past two years, on the pitch and off, as well as looking at where I’m aiming to get the club now that we’ve made some progress. I said at the start of the save that I like to have a plan in place and with all of the changes, we’re getting better placed to achieve what I want. I don’t always measure success at a club by winning trophies, although it obviously does help, but I look at the club as whole. What are the facilities like? What kind of staff is there? How many season tickets do they sell? etc etc. Commercial success is a big part of football these days and I like to see financial progress with my teams. When I started this save, Wisla didn’t have a huge amount of money. In fact, we were barely in the black. Times have changed though as we’ve become more stable financially. Sensible transfer business is a big part of that, but we’ve improved in plenty of other areas. I don’t want to bog you down with figures so I’ll pick out some key bits. Doubled our monthly merchandising sales since the first season. Season tickets up by around 30%. Sponsorship up by €1m per season. Big jump in corporate facilities income thanks to European campaigns. Obviously we’re spending a bit more money on player wages as we recruit better players. The wage bill has doubled, but the success it has brought has paid for itself with prize money. Wages in Poland aren’t very high so I’m not throwing money away. We’re only spending €163k per week at the moment. Improving facilities is very important to the long term success of a club and I think that’s very true in terms of what I want to achieve and what I’d like to leave behind if/when I eventually move on from a club. Our facilities were the most basic available. I couldn’t upgrade anything until we had a little bit of money behind us. With that side of things improving, I can then talk to the board about upgrading our facilities. At time of writing, I’m in January 2022. We’ve upgraded our Data Analysis Facilities five times to get up to an Average level. Youth and Training Facilities have levelled up once to Good and Great respectively. We’re also working on another upgrade to training facilities, which will be finished by the end of this year. Finally, Junior Coaching and Youth Recruitment are now at maximum levels of Exceptional and Extensive. I tend to place quite a lot of emphasis on youngsters coming through at clubs. I’d say developing youngsters is one of the best and most frustrating parts of the game. You spend time working on players and when it doesn’t work out, you can lose your motivation a bit. It’s stupid, because more players fail than make the first team, but in turn, you can sell these ‘failures’ (they’re not failures, they just don’t work for you) to other teams in the league and hopefully they’ll work out for them. I’m only going to focus on a couple of young players here as I don’t want to pick out eight players and then have to report in that they’ve all been useless. First up is Filip Ferra. Wingers are usually the easiest to accommodate into any system. Stick them out on the wing, if they have a bad day, it’s fine. Ferra falls into that category. I had a rather good winger that I got for free, but a whole host of big clubs were in for him and he eventually joined Arsenal for around €7m. I could have bought a new winger, but I had this guy waiting in the wings and decided to give him a chance. It has proven to be the right decision. He’s had ups and downs, but this year he’s played 29 games, scored 10 and has 7 assists. He’s got some improvements to make, for sure, but for his first season as a regular starter, that’s a great return. It also meant I pocketed that €7m to spend in other areas. Dariusz Sapa was not one of my youth players. I signed him from MOSP Bialystok in the lower leagues for €10k when he was 15. I originally signed him to be a successor at deep lying playmaker, but as my system has changed, he’s now working towards becoming a Mezzala. He’s making big strides with the U18’s and he’s made ten appearances for the first team this season. One for the future, but a lot of work needed to get into the first eleven. It’s great to have made progress, but results are what define a manager. We have made some great progress in the first three years at Wisla. We were expected to finish 9th in my first year in charge, but we managed to get ourselves into an excellent third place. We were 10 points behind league winners Pogon Szczecin, but we had the best defence in the league. There was a lot to be proud of and a lot of issues that needed address. Tactically, we were a bit of a mixed bag. Starting well with a counter attacking 4411, moving to a 4141 and eventually a 4123. I had to get a plan whipped up for the next season. The following season saw us win the title by 7 points. It was a lot less impressive than it sounds as we were 15 points clear at one stage, however, things sort of fell apart. We drew 11 games along the way to that title and it made me re-assess where I was going with the system I’d setup the previous year. I sort of picked away with the same system in the third season, delivering another title, 9 points clear this time but still with a lot of draws. I’m not sure if we were really good or the usual suspects had been really bad. Legia have barely challenged for the title and Jagiellonia hadn’t made the Championship Group in the split since the first season. Lech Poznan finished third in my two title winning seasons, but they were some way back from the top. I’m now into season four and with yet another tactical rejig, I’m much happier and I’ll hopefully get a blog post out in the near future about my thought process behind that system and why I chose the roles I chose etc. Last year we got to the final qualifier in the Champions League last season, only to be knocked out by Red Bull Salzburg on away goals. This season, after going through what can only be described as the longest route to qualify, we made the group stage of the Champions League. Ok, the Europa League isn’t to be sniffed at for a club like us, but the Champions League is where the money is to be made and where you can really tested yourself against the best. I’ve not had much luck in the Polish Cup as I’ve been rotating my squad for those games. We have picked up one Polish Super Cup but lost this years game against Lechia Gdansk. I have signed quite a few players by this point. Running through every player is a bit of a pointless exercise, but I will pick out a couple of my better signings. Petar Stojanovic joined from Dinamo Zagreb for €100k. I thought he was a pretty great backup, but after giving him some game time, he eventually worked his way into being a first team regular. Samo reliably informed me he was one of those great bargains a few games back, but I’ve been playing second level football and had never seen him. A bargain price for a great player. He’s put in some very good performances since he arrived. Once I’d worked out my new system, I’d come up with player profiles by default. I was now looking for certain types of player for each position and when I stumbled upon Olexandr Yakymenko at Barreirense in Portugal (he’s part Ukrainian) I had to have him. When my scouts reported on him and told me he’d cost €26k, I thought I’d misread. I slapped a bid in and in he joined. He did get a high wage, but with his fee being pennies, I was ok with that. Why did I sign him? I was looking for a quick (relative to my league) wide striker that had good off the ball movement and was composed enough to finish well. He’s not perfect, not by a long way, but he is very much a key part of the team. When he joined, he was a striker and I’ve now retrained him to play on the left. I’m possibly tempting fate with this next one as he’s only six months into his first season with us. I think just from the financial standpoint, it’s a good deal. I have signed quite a few Polish players, but it’s not cheap. I was desperate to sign a couple of young Polish strikers, seeing Jaroslaw Niezgoda changed my mind though. He was at Legia Warsaw in the first season before Stoke snapped him up for €3.1m. It never worked out for him and he was released from his contract after two sub appearances and a loan spell in Portugal. He’s had a few injuries since he joined, but he seems to be settling in now and has 9 goals in 13(11) appearances for us. He’s only 26, so he should be at the peak of his powers. Hopefully he can fire us to the top of the table again! Not a bad player for Free. 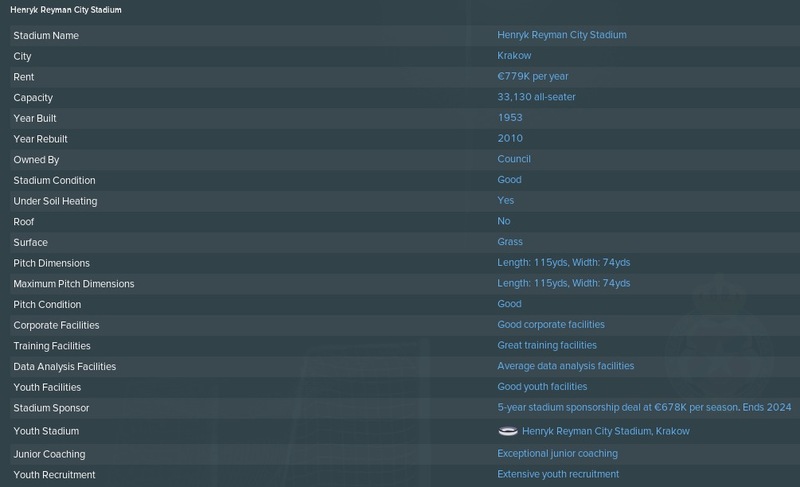 As a financial summary on my transfer deals, to date I’ve signed 24 players at a cost of €7m. I’ve also sold 24 players and received €19.5m. My highest fee spent is €1.1m and my highest fee received is €7.25m. A lot to take in there as I do play quickly. I’m lucky that with work, when it’s quiet, I work at home. This enables me to get a bit more game time than most so summaries are much more likely than year-on-year progress. I do have a tactical post in the pipeline that I’ll be working on over the next week or two. Depending on how that goes, I might have to break it down into smaller pieces. Thanks again for reading, much appreciated as always.